The knock sensor on your Volkswagen is able to detect knocking. It then adjusts the timing or the boost pressure to reduce the risk of damage to the pistons or engine heads. These sensors are designed to compensate for the variations in fuel quality. They balance the performance regardless of whether you are using a high octane or a low octane fuel. A knock or a ping occurs when there is a fuel to air mixture that is out of the norm. The spark is no longer within the optimum range for combustion. 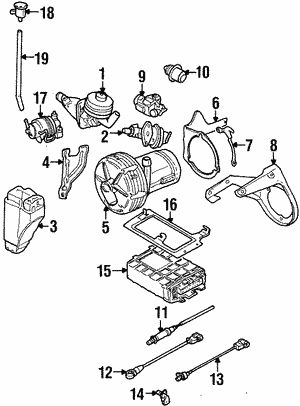 A knock sensor can be found on the cylinder, intake manifold or on the engine block. It sends signals of any vibrations that may indicate a knock to the PCM. The PCM then responds by changing the timing. A replacement knock sensor should always be optimized to meet the standards of Volkswagen. This is why you would use genuine OEM replacement parts rather than cheap aftermarket copies. A cheap copy will not offer peak performance for your GTI or Jetta and will need to be replaced sooner than a factory part. We do not offer cheap aftermarket copies of OEM parts. We offer fast and affordable shipping. We have a no-hassle return policy. We have other engine components like timing belts, manifolds and more. Use our online ordering system today to order your knock sensor.